Located in Calaveras County in the Sierra Nevada foothills, Town Hall Arts with Galerie Copper is nestled in the Town Hall Building of Copperopolis Town Square. The clock tower may be seen from Highway 4 by travelers on their way to enjoy the many attractions of the Sierras, including Yosemite National Park. This is Copper, the gallery's resident dog. Come see her during business hours. She's usually available to say hello. All Art Supplies and Books 50% off! Shop early while inventory is high! Art supply shelves and racks also for sale. Additional Sale: Judie Cain is offering all of her originals at 50% off during this sale. Eva Walker’s art is 25% off. 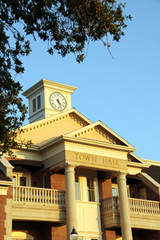 The Town Hall building will become a hotel! 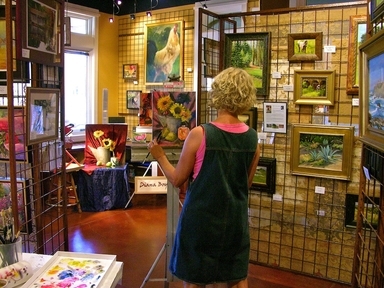 The frameshop, classroom, and small gallery will be moving to another location at Town Square June 1. Because the new location is much smaller, we do not plan to continue selling art supplies. Come down and get them now while the getting’s good! Ninth Anniversary Celebration last week! Special thanks goes to artists who donated paintings for the silent auction Judie Cain, George Haskell, Kathie Peery, and Linda Moore. After we close our classroom, we will continue conducting our Young at Art free classes in the Courthouse Building. Louisa King, Jeanne and Ken Plant, Jeannie McWhinney, Shari Schweiger, and Eileen from upstairs. Music by MJ Young, Bartenders Jon Slezak and Rod McWhinney, and Price-Waterhouse Alice Chapman and Renee Rondon. quality art supplies, and custom framing. art in progress in Atelier Copper, our art studio. custom frames and mats at reasonable prices! Why send a card when you can send a piece of art? Galerie Copper also has a unique line of artist-signed greeting cards for every occasion. Signed prints of local art work are also available in our print gallery. We make Art! Come learn to draw and paint! 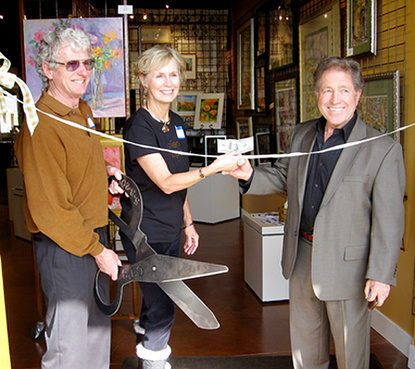 Owners Larry and Susie Hoffman, along with Supervisor Russ Thomas, cut ribbon for Grand Opening of Town Hall Arts/Galerie Copper April 1, 2010. Supervisor Thomas hands Susie a $100 bill as credit towards the first sale. Photo by Bill Mesusan.